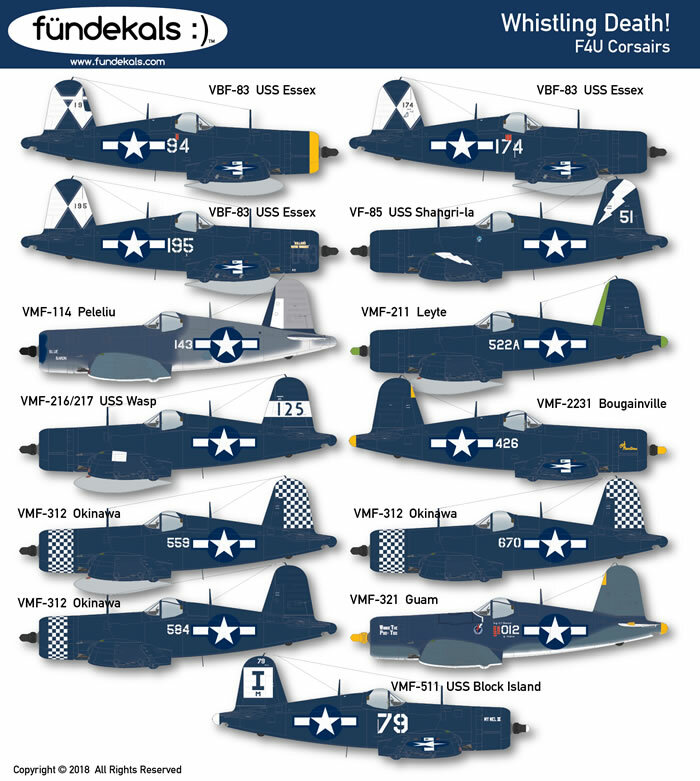 Fündekals is pleased to announce that our new F4U Corsair project has finally come to completion! We know you have been patiently waiting, and we hope you will find the result worh the wait. As often happens, the more we dug, the more we found, and we ended up finding some things that we not only did not expect, we found some things that we are pretty sure have never been documented before! Subjects include F4U-1As, FG-1As, FG-1Ds, and F4U-1Ds, spanning late 1944 to th end of the war in the Pacific. Our instruction manual (we can’t call it a “sheet”) comes in at a whopping 48 pages, packed full of detailed four-views of each subject as well as lots of photos, some never before published, and background information on the squadrons that operated these late war killers. We have uncovered information on F4U-1D drop tanks that will change the way you load your model, and have included an eight-page section on the subject of these tanks (with research ongoing…). The decals will be availble in 1/72, 1/48, and 1/32 scales, and we plan to have them with us at the IPMS/USA nationals in Phoenix in early August, with availability via our web site (www.fundekals.com) shortly afterward. As always, the instruction manual will be availble as a downloadable PDF regardless of whether you purchase the decals or not - although of course we hope you will. Look for our table in Phoenix - we’d love to meet you and talk airplanes! Thanks to fundekals for the information and images.